Isn't honey a wonderful thing? I love honey. There is nothing like honey slathered all over a piece of homemade white bread, still hot from the oven. It's delightful on crumpets, pikelets and scones too. Honey can be used as a substitute for sugar in many baked goods and is also fantastic as the main flavour. This cake is fantastic. A lovely mix of the distinctive taste of honey and tasty spices. It smells fabulous when it is baking. 1. Preheat your oven to 160 degrees and place a rack so the the top of the cake tin will be in the centre of the oven. 2. 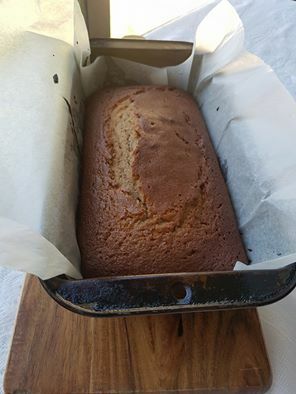 Line a 20cm x 10cm loaf tin with baking paper, with paper hanging over the long sides. 3. Place honey, golden syrup, butter and sugar in the jug with the kneading blade. Select Sp3 Temp 70 Time 3.00. 4. When the programme is finished add all other ingredients. 5. Select Pastry P1 for 1.00. After 30 seconds, stop the machine and scrape down the jug. Resume programme. 6. Once programme is complete, pour batter into your prepared tin (note that the batter is very liquid). 7. Place cake in the oven and bake for 30 - 35 minutes. 8. When the cake is firm in the centre or a skewer inserted in the middle comes out clean, remove from the oven and allow to cool in the tin for 10 minutes before turning out to cool on a wire rack. 9. Can be eaten warm or at room temperature. Note - you can cook this in any shaped tin you prefer. Just keep an eye on the cooking time.